Seaweed is one of the greatest super foods on the planet. The earth’s oceans make up nearly 70% of the planet’s surface and absorb 70% of the sun’s energy. Much of that solar (radiant) energy is absorbed by seaweed. Other than needing sunlight, seaweed is self-sufficient in its environment; it can absorb everything needed to sustain life directly from the seawater that surrounds it. 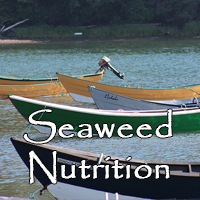 As a result, seaweeds are the most nutritionally dense plants on the earth, and an abundant source of minerals. Is organic and a source of Vitamins A and C.
Can contain up to 10 times more calcium than milk, and 8 times as much as beef. Is an excellent source of iodine, a critical nutrient for maintaining a healthy thyroid that is not found in many other foods. 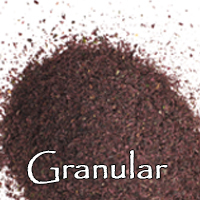 Contains lignans (naturally occurring chemical compounds), which have anti-cancer properties. Seaweed is also an amazing source of antioxidants and can helps prevent inflammation, which is a contributor to a variety of ailments, including arthritis, celiac disease, asthma, depression and obesity. Many have embraced seaweed in their diet for its health benefits. 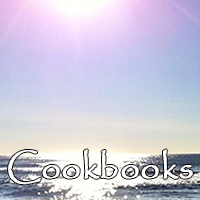 It is also a popular addition to those following a vegan, vegetarian, kosher, organic or raw diet. It truly is an amazing plant, please try our products and “sea” for yourself! Seaweeds contain anti-oxidants proven important in preventing cancer, and an array of chemicals that contribute to therapies for fighting existing cancers: particularly cancers of the colon and breast, and leukemia. Fucoidan is just one example; comprised of glycoproteins and sulfated polysaccharides, this compound, found in brown seaweed native to Maine, elevates effectiveness of the immune system, and exhibits both anti-viral and anti-cancer properties. 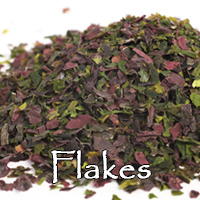 Seaweed is a rich source of iodine and other trace minerals extracted from seawater. Often a result of iodine deficiency, many people suffer hypothyroidism; an ailment caused by low hormonal output of the thyroid gland. For decades effort has been made to address this issue by introducing iodine into table salt. With increasing evidence on the need to reduce salt intake, adding sea vegetables to a diet to assure iodine intake, makes good sense. 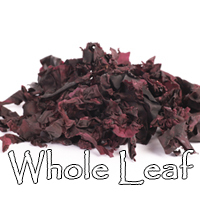 Credible research has shown that edible seaweed offers at least two pathways for fighting obesity. Fucoxanthin, a pigment found in brown seaweed and prominent in key food species in Maine, facilitates fat burning and prevents the accumulation of fat cells. Alginate, a form of fiber found in kelp, is very effective at absorbing upto 75% of the fat from foods passing through the gut, and preventing entry into the bloodstream. Sea vegetables aid in stimulating release of the digestive enzymes that enable absorption of nutrients and facilitate the metabolism of fats. 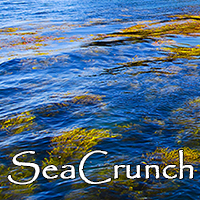 Studies have shown enhanced prebiotic effect from polysaccharides in seaweed that enhances both the composition and activity of microflora in the stomach. Sea vegetables first detoxify the body, and then facilitate excretion of the accumulated toxic waste. The binding property of naturally absorbent alginate in seaweed renders indigestible, toxic materials and other pollutants, allowing passage out of the body. 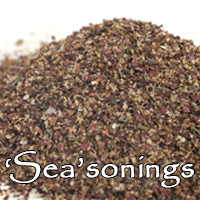 Sea vegetable are very helpful in achieving and maintaining lower levels of triglycerides and cholesterol in the body. Once lower levels are established, this new circumstance helps sustain a healthy heart and good circulation, and helps prevent heart failure, atherosclerosis, and peripheral artery problems. The fat-burning property of the fucoxanthin pigment present in edible brown seaweed, coupled with triglyceride absorption action of alginate, underscores the benefit gained from eating brown algae. Laminaria digitata, a native Maine kelp also known as kombu, contains significant levels of both of these compounds and offers a particularly high level of anti-diabetic benefit. The abundance of essential vitamins, minerals, amino acids and anti-oxidants in seaweed helps keep skin revitalized, moisturized, and youthful, and counter aspects of aging. Seaweed wraps can cleanse skin directly by expelling toxins and inherent anti-inflammatory properties are useful for treating rashes and wounds. 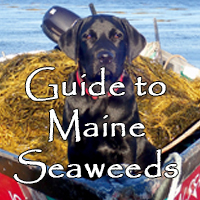 Try some Edible Seaweed from Maine today! Disclaimer: The information and products provided throughout this site have not been evaluated by the U.S. Food and Drug Administration. They are not intended to diagnose, treat, cure, or prevent any disease. Please consult a health professional before undertaking any new health regime.